Antique floral diamond wedding rings display an enduring romantic allure, inspired by the innocent beauty of the Victorian Age. These bands incorporate the timeless appeal and brilliance of clear white diamonds with bursting blossoms of demure details. Weaving ivy vines, floral etchings or even flowers that sparkle with diamond petals all draw from the beauty of nature while symbolizing eternal vows. Looking for floral inspiration? Here are five amazing design ideas to create your ideal antique floral wedding band. A row of pavé white diamond set within a gold or platinum band is a timeless look. Add more interest to this classic design by adding etched floral details on the top and bottom of the band. 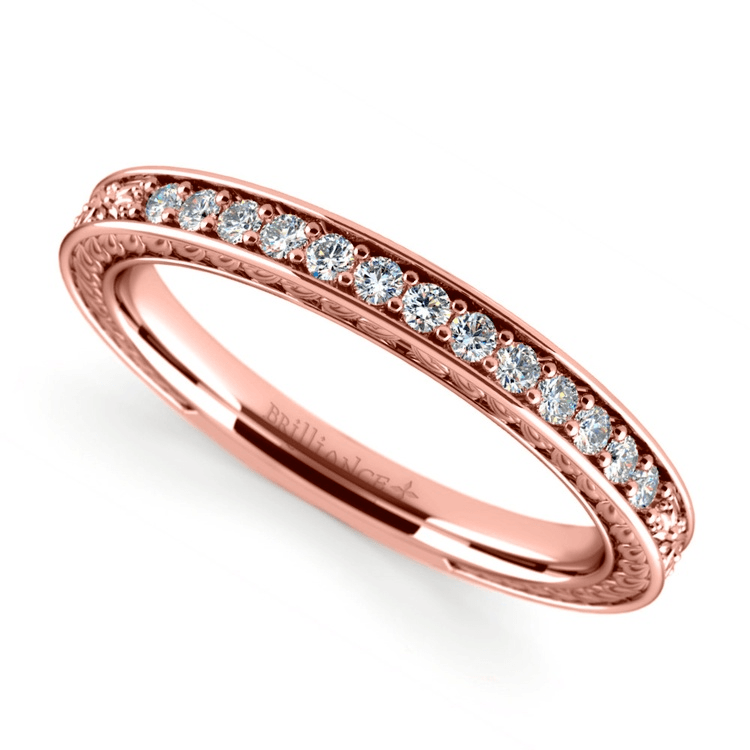 Or include floral details throughout the entire band for the ultimate romantic ring. Pavé diamonds can be tiny dots of sparkle, or you may choose larger carat weights for the bolder brilliance. Pavé is the French word for “paved,” and pavé details come in two varieties: classic pavé and micro-pavé. What’s the difference? Micro-pavé details showcase more metal within the setting and utilizes the prong as a design element; while prongs are meant to hold the diamonds their metallic lust also creates a more defined cobblestone effect for pavé settings. Micro-pavé settings are more streamlined and give the appearance of seamless streets of diamonds. Both are stunning, but classic pavé nods to vintage inspiration while micro-pavé creates a more modern and contemporary design. A thicker band allows you to add more details within the ring. Create a band that incorporates flowers bursting with diamond petals. For the flower’s center, choose a black or canary yellow diamond. Remember, diamonds are available in a spectrum of colors. When creating antique floral diamond wedding bands, use colored diamonds to paint the ring with interest. On a budget? Use diamonds as the tiny petals and then add your favorite gemstones to create the center. Or paint the petals with colorful gemstones and drop in a diminutive diamond for a fiery centerpiece. If you choose gemstones as the center, consider cabochon cut stones like turquoise or even lapis lazuli to create a more modern and eye-catching design. While a cabochon cut is a non-traditional choice, these gemstones pop within the ring and draw the eye to the hand. Engrave your band with floral garland that weaves its way around the finger. Highlight the amazing floral details with a frame of diamonds. 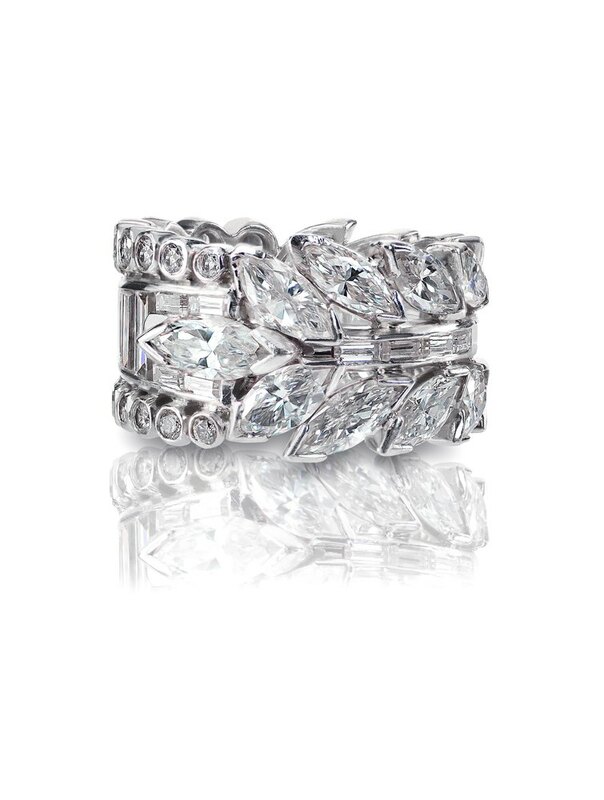 A crown of diminutive white diamonds may be set around the top and bottom of the band as a sparkling border that serves to draw the eye to the ring’s floral details. Channel set diamonds are the ideal choice for crowning details. This setting also allows you to play with patterns by alternating diamonds with gemstones–birthstones are ideal! Or keep the line of diamonds seamless and white for a fiery crown that emphasises the feminine floral details of the ring. Some couples even add a crown of diamonds on the inside of the ring’s band; while these designs seem invisible, the diamonds still grab the light and illuminate the ring on the hand! While scrollwork or floral etchings may be featured within the band, you also may use tiny diamonds to outline your floral designs. Trace romantic details with accents of diamonds for a brilliant and sparkling pattern. For a more subdued appeal, choose shiny black diamonds instead of fiery white diamonds. So where do you place your sparkling accents? 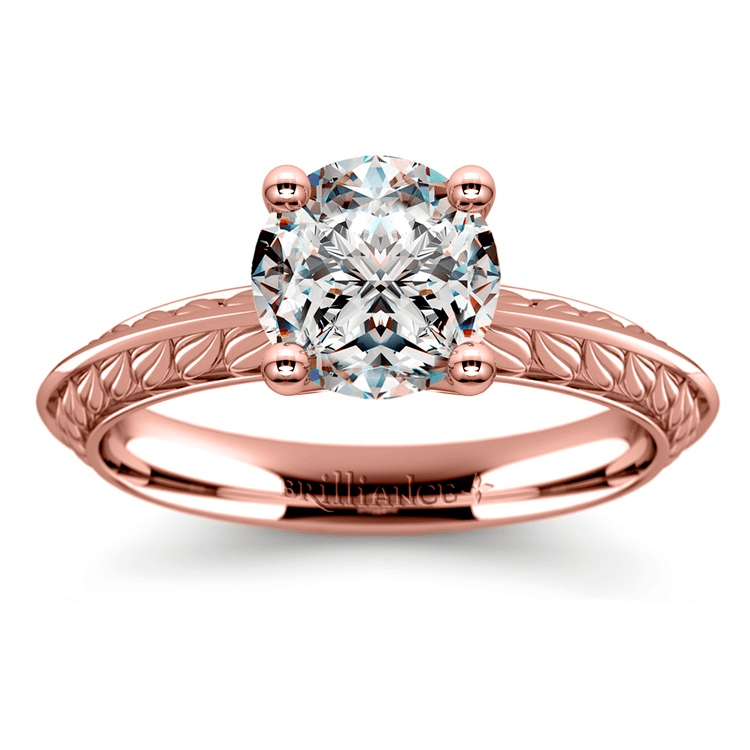 We love when couples tuck tiny diamonds into the swirls of vines or even between dots of milgrain. Sparkling accents can be placed anywhere that you wish to add fire. You also can choose to add diamonds around every floral detail within the band for a seamless spark or just add diamonds into a few of the designs for a glint of sparkle. The shape of your diamonds also can add interest to the setting; round diamonds look fantastic when hidden within circular or curving designs. Fancy cut diamonds like marquise or pear create their own unique design element; we love pear shapes to create dew drops next to flowers. Floral details don’t have to be visible to make an impact. Many couples hide details inside the band of the ring for a sweet secret that only the wearer can appreciate. Imprint a favorite floral motif or incorporate your own whimsical antique floral drawing as a special surprise. 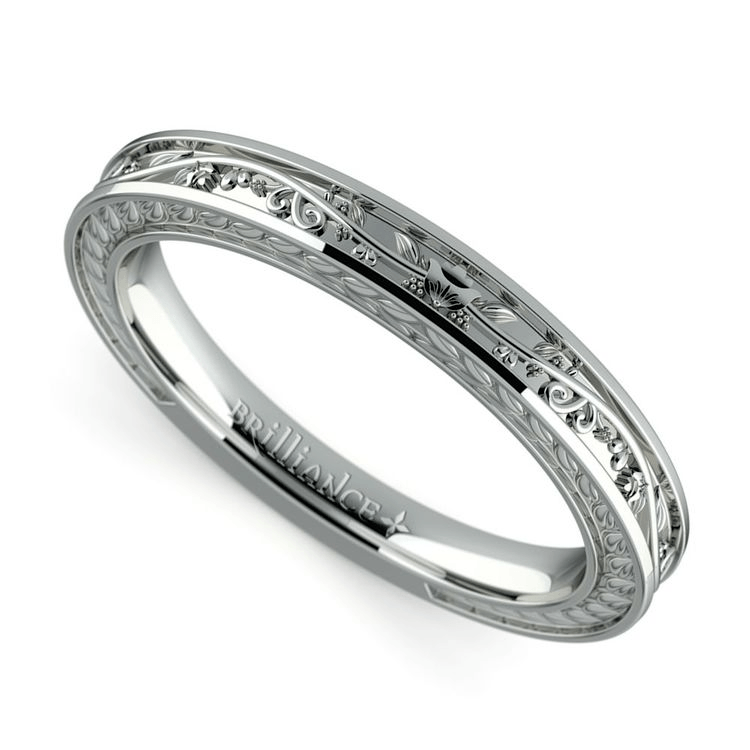 Engrave swirling vines or create more intricate rose patterns inside the band. The options are endless, and we love when hidden floral motifs are paired with a meaningful engraved phrase! Pull from a poem or choose a special date or word. When you use diamonds as an accent within your floral design, remember to pay attention to the 4Cs, especially if you incorporate higher carat weights within the band. The brilliance of a diamond is affected by the clarity, cut and color. Review and research the grades of diamonds before you finalize your purchase, and do not choose clarities below a slightly included (SI) grade. Diamond hue, however, is a bit of a personal preference. Some buyers are fine with a slightly warmer hue and are willing to sacrifice color for a larger carat weight. If you select a warmer diamond color but want the diamond to look whiter, choose a yellow gold setting, which will help mask a yellower diamond hue. If you love gold for your wedding band metal, choose a 14 karat setting (or higher). Gold purity is based on a 24 karat scale—with 24 karat being 100 percent pure. This means that 18 karat gold is 75 percent pure gold, and 14 karat gold is comprised of more than 50 percent gold. However, 10 karat gold is only about 41 percent pure. Karats count! Antique floral diamond wedding rings exude a romantic appeal. Use diamonds as perfect petals for your floral design or accent the ring with rows of tiny diamonds for seamless sparkle. However you choose to plant the seed of floral inspiration within your ring, incorporate your own personal style for a truly meaningful masterpiece.